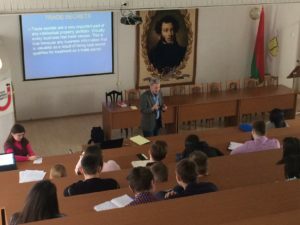 On behalf of The Center for International Legal Studies, Steve Zlatos spent two weeks at Brest State University in Brest, Belarus as a guest lecturer on the American Legal System and Intellectual Property Law. The Center for International Legal Studies – CILS/the Center – is a law research, training, and teaching institute, established and operating as a non-profit, public interest society under Austrian law. Its essential purpose is to promote and disseminate knowledge among members of the international legal community with 5,000 lawyers worldwide having been recognized for their contributions to CILS projects. Through its Senior Lawyer Visiting Professors Program, the Center places experienced practitioners in visiting professorships at institutions in Eastern Europe, Russia and former Soviet republics, China, India, and Myanmar. Almost 400 senior lawyers have taken up almost 900 appointments since the program began in 2006.